This linen-blend dress is cut in a shift style to gently skim the body and create a relaxed, yet flattering fit. It's short sleeves, with a V-neck and strap detail at the back. The handy front pockets and cutwork detail along the hem. LADIES WHITE BEACH DRESS. 60% VISCOSE, 25% COTTON, 15% LINEN. (TO FIT SIZE 12). Lovely cool cotton. T hanks for looking. Elasticated waist. Beautiful short sleeved shift dress. Navy and white stripes. Is a size 6 but but it seems quite generous, and has a slight stretch to the fabric so may fit an 8 too. In great condition, only slight flaw to note is a couple of fluff bobbles as seen in the pictures. • floral Lightweight dress bought from Next. • Polyester. A lovely print shift dress with a silky finish to the fabric. the dress has 3 buttons at the back of the neck. the dress sits just above the knee. size UK 12. White background with a bright multi-coloured floral design and butterflies dotted about. Round neckline with tie. Concealed side zip. 23" (58.5cms) across the back and approx. 41" (104cms) from shoulder to hem. Next Size 18 Denim Zip Up Summer Dress. Great condition. Dispatched with Royal Mail 2nd Class. Next Size 10 Shirt Dress Floral Smart Casual Everyday Weekend Holiday Summer Thanks for looking. Please check out my other items. 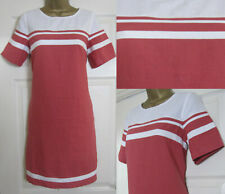 Next Red and white Summer Dress size 18 Tall BNWT. Condition is New with tags. Dispatched with Royal Mail 1st Class. Really pretty pattern and style to this dress. So flattering. Very comfy when I tried it on but not had chance to wear it before unexpected and rapid weight loss. A bargain as you will get lots of useful from this versatile dress. Ladies Next Dress. Size 18 length 36". 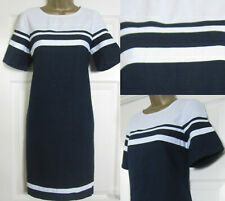 Ladies Cornflower Blue Cotton Sun Dress - Next - Size 12. That I would not be happy to receive myself. This Very Stunning NEXT Dress Is In Great Condition. 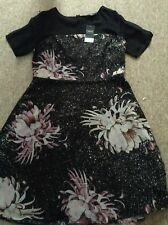 Beautiful silver metallic dress size 18 from next new without tags. Has a lovely silver shimmer, perfect for a night out! All items are sent within 2 working days by recorded post, from a smoke free home. NEXT Womens Yellow Summer Floral Ditsy Bardot Dress - Size 14 UK Only Worn Once. Condition is Used. Dispatched with Royal Mail 2nd Class. Black and green short dress or long tunic top with cut out style back. Great for Spring and Summer work or casual. In good condition from Next. Shirred bodice and bardot neckline. Pull on style. Next Summer Denim Blue Dress Size 20. Condition is Used. Dispatched with Royal Mail Signed For® 2nd Class.